CELDi - CELDi 2016 Fall IAB Meeting and Research Symposium Great Success! The Center for Excellence in Logistics and Distribution in the Department of Industrial Engineering hosted its fall 2016 Industrial Advisory Board Meeting and Research Symposium at the University of Missouri in Columbia on Oct. 25-26. The CELDi meeting drew together faculty and students from three partner CELDi sites and industry leaders from five membership companies. The gathering kicked off with peer mentoring, which has been a well-received activity for several years. This allows students to spend one-on-one time with industry leaders to ask questions, learn about the industry and careers beyond college. A reception and poster session followed. During the poster session the students present project posters to industry members. Each poster was evaluated and submitted with remarks. The student with the best poster was then presented with an award. Both students and industry leaders agree this dedicated time spent together allows them both time to connect and learn from each other. 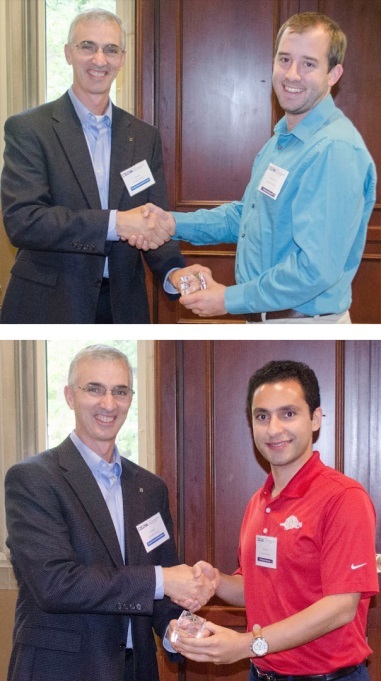 This year there was a tie for first place for the student poster award between Payam Parsa and Bobby Cottam, both from the University of Arkansas. Parsa presented his poster, Multi-Stop and Load Building Optimization Models. Payam’s faculty adviser is professor Manuel Rossetti from the Industrial Engineering Department. Cottam presented his poster, Quantifying Resilience to Enable Engineered Resilient System. Bobby’s faculty advisor is professor Greg Parnell from the Industrial Engineering Department. Industry and research presentations took place the following day along with faculty and students touring the Scholastic Books distribution facility in Jefferson City, Missouri. Guest industry speakers this year were Shannon Frost, vice president of greetings operations, and Bonnie Heenan, logistics solutions director, both of Hallmark Cards Inc. Faculty research presentations are the focus of the meeting with completed projects presented by the faculty researcher/primary investigator of the project. The spring 2017 meeting will be held at the University of Arkansas, April 18-19. For more information on CELDi, contact Manuel Rossetti, CELDi director, rossetti@uark.edu, 479-575-6756. For more information the upcoming spring conference, contact Sandy Sehon, sehon@uark.edu 479-575-7936.